VroomVroomVroom makes comparing and booking rental cars in Los Angeles easy! We have listed down all the vehicles offered by major car rental companies in California including Avis, Budget, Dollar, Enterprise and Hertz. Filter the results by price to help you find the cheapest car rental. This will surely save you time from browsing through different websites and comparing rates. Los Angeles is the heart of the entertainment industry; home to the world-famous Hollywood district responsible for many film, television and music productions. Visitors can go behind the scenes at Universal Studios Hollywood and see how some of their favorite films were made. A hire car in Los Angeles allows you to visit some of the city's iconic beaches, spend time shopping at Beverly Hills or travel beyond the city limits. Wide selection of cars: There are many rental locations you can choose from including LAX, which makes it easier to pick up and drop off your rental car in Los Angeles. We can help you find the best rental car model that will suit your budget and needs. The rental cars we compare range from economy to luxury. Great rates: We have negotiated with our partners so we can provide the best rates on Los Angeles car rentals. Check out our Price Promise for more information. Excellent service: We have been helping people book a rental car for more than 15 years. If you need assistance in booking a rental car, feel free to contact us via phone, email, or live chat. Our friendly customer care experts are ready to help and answer all queries. Summertime is a busy period in Los Angeles, with large crowds and higher prices on accommodation. Traveling outside of summer will mean comfortable temperatures, although there is increased rainfall over the winter months. Los Angeles hosts many big events year round, including well-known awards ceremonies, music festivals and film events. Visitors will never be short of things to do. Jump into your rental car and drive to West Hollywood to take a three hour tour and see where your favorite movie stars live aboard a trolley or double decker bus. Alternatively drive to the Los Angeles Zoo and Botanical Gardens this fall vacation. Pick up a zoo map at the entrance and visit all the animals. Once you've picked up your car rental in Los Angeles, you are free to fight the traffic and explore the city. You may choose to hit the freeway and visit some of California's great attractions. Glendale, Long Beach and Santa Ana are within easy reach of the city, and the home of Disneyland, Anaheim, is only 24 miles away. San Diego is a popular road trip from Los Angeles, only a two-hour drive with a rental car. If you are still unsure of where to go, check out our article on 8 Places To Enjoy Breathtaking Views of Los Angeles. Make sure to bring your high-definition camera and selfie stick with you so you can take spectacular pictures of L.A.
For more driving tips in Los Angeles, click here​​. Many rental car companies operate out of Los Angeles International Airport (LAX), and most provide phones near the baggage claim areas on each terminal's lower level for customers to call a free shuttle to transport them to their vehicle. The central complex has nine passenger terminals connected by a two-level roadway, with baggage claim on the lower level. Free shuttle service is provided between all terminals and remote parking lots. The airport allows major rental companies to pick up and drop off their customers at the terminal via courtesy shuttle. Travelers can wait for this service under purple "Rental Car Shuttle" signs outside baggage claim. Just look for the Visitors Information Centers in the baggage claim area. Whether you are planning to book a rental car in Los Angeles or at Los Angeles International Airport, VroomVroomVroom can help you find a vehicle that will suit your budget and needs. Los Angeles in Southern California is the second biggest city in the United States by population, and the center of North America's third largest metropolitan area (behind Mexico City and New York City). As a center of international trade, business, entertainment and culture, Los Angeles is a rich economic power with worldwide importance. It's also the city that includes the famous "Hollywood" district, with its movie, television and music corporations. The "City of Angels" is known as a very ethnically diverse metropolis, with its Spanish name – "Los Angeles" means "The Angels" – and its history as a part of nearby Mexico from 1821 to 1848. Some residents call themselves "Angelenos". Los Angeles was founded in 1781 by the Spanish, was a Mexican holding after Mexico's War of Independence, and was finally sold to the United States in 1848. California became a state two years later. Los Angeles hosted the 1932 and 1984 Summer Olympics. 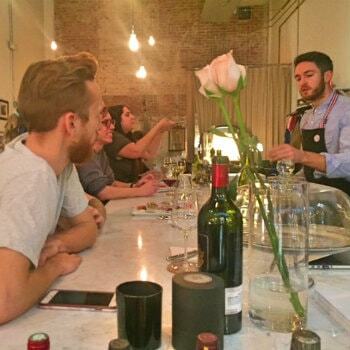 Wine and Dine Walking Tours provide a great opportunity for visitors and L.A. locals alike to follow their taste buds around the many charming communities within Los Angeles. Their hosts strive to introduce guests to the true nature of each neighborhood by showcasing locally owned restaurants and wine bars. Their tour groups do not exceed 8 people (unless a private group is booked) to ensure a personal touch and attention from their tour hosts. If you are looking for hidden gems, great conversation, and even better food and wine, then you have come to the right place! All wine and food is included in the price. Drive your rental car over to the Getty Center in Central Los Angeles. Located at Getty Center Drive, it's the most popular art museum in the city, and features a spectacular collection that includes works by Cezanne, Monet and Van Gogh, spread throughout its architecturally stunning six buildings and gardens! Check out their calendar of activities for the schedule of tours offered inside the center. If you're a fan of classic music – and especially if you would call yourself a music connoisseur – then by all means, take the car rental at the Walt Disney Concert Hall for a symphony performance of the Los Angeles Philharmonic . You may never experience a more crisp, clean sound from a musical performance, because the Disney Hall boasts the most acoustically sophisticated design of any building on Earth! California Science Center features over a hundred interactive science exhibits, demonstrations and programs that is suitable for all ages. Since 2012 is home to Space Shuttle Orbiter Endeavour. The shuttle is to be the crown jewel of the science museum's new Air and Space Center, a 200 thousand-square-foot expansion to the main building. Famous for being the largest art museum in western part of United States, Los Angeles County Museum of Art (LACMA) houses a wide variety of art collections and exhibits ranging from history to geographic. Art lovers will surely be fascinated over 130,000 masterpieces of Latin American Art, Asian art, and pre-Columbian pieces made by modern and contemporary artists.Established in 1910 LACMA continues to attract over a million visitors annually. 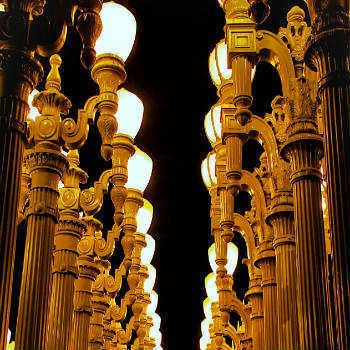 One of the most iconic structures is the Chris Burdens Urban Light which can be seen at the museum entrance. It consists of 202 restored street lamps built between the 1920s and 1930s; and has become a popular spot for picture taking. The Griffith Observatory is another must-see attraction in Los Angeles. With a rental car, you can easily zoom to Observatory Road at the end of Vermont Avenue, where you can find the observatory nestled within the 4,000-acre Griffith Park. Admission and parking at the Observatory is free! This is the best place to go sightseeing because it offers breathtaking views of the Los Angeles basin and the Hollywood Sign. You can also explore their exhibits and public telescopes, buy souvenirs at their bookstore and enjoy some delectable snacks at their café. Check out their special events for a chance to learn astronomy through different star formation and planetary observation. Back in 1923, the sign was created to campaign a real estate development and called it "Hollywoodland." It was soon renamed to "Hollywood" and is now one of the most iconic signs in Los Angeles. This sign has been featured in several movies and television shows because it depicted the glamour and success of the entertainment industry. Situated on top of Mount Lee, visitors may either hike to get up close to the sign or drive through the trails of Santa Monica Mountains. Drive carefully and check the caution signs since the roads are quite steep and narrow. To get the best view of the Hollywood Sign, head to The Griffith Observatory or Mulholland Drive. Hollywood Walk of Fame is a famous public sidewalk along Hollywood Boulevard and Vine street. Approximately 10 million visitors visit this popular sidewalk each year thus making it one of the busiest tourist attractions in Los Angeles. Since the Walk of Fame is open to the public, make sure you arrive during the off-peak hours so you can enjoy getting a selfie with the name of your favorite celebrity. There are more than 2,500 embedded stars on the sidewalk so that will surely keep you busy all day. 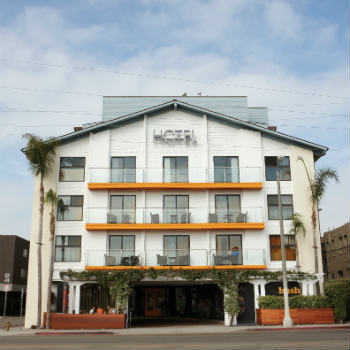 You will surely be mesmerized when you see the colorful rooms which feature bold carpets and drapes of this hip hotel overlooking the picturesque Venice beach Boardwalk. Surrounded by trendy restaurants, the hotel has easy access to Abbot Kinney Boulevard and Venice Canals which are approximately 8 - 10 minutes away.Guests can relax at their own private balcony while enjoying the stunning city and ocean views. Take advantage of Hotel Erwin's world-class amenities including in-room spa treatments(fee), premium bedding, complementary gym pass and high speed WiFi. You may also want to check out their rooftop bar where you can have a taste of their delectable Southern California Cuisine and Cocktails. The Line Hotel was designed by Sean Knibb, who have drawn inspiration from Los Angeles' rich culture - and this can be seen from the modern interiors to handmade furnishing of each room. Located in Southern California in Koreatown, the hotel is just a few minutes away from main attractions such as the Staples Center, LACMA and Griffith Park. One of its most popular amenities is the pool deck with a greenhouse restaurant which is perfect for relaxation. If you are in the mood to party, check out the neighborhood bars at night. One of the most distinct hotels in the heart of Los Angeles is the Farmers Daughter, which is known for its country-inspired rooms. It's superb location gives it easy access to the city's hot sports including the Farmers Market, Grove Entertainment Complex, and the CBS studio. The boutique hotel was featured in leading LA magazines and newspapers for its ambiance. You will surely love its top of the line amenities such as 24-hours concierge service, outdoor pool, sundeck and trendy bars. Located within the Grand Central Market, Eggslut will give you a balance of comfort and innovation inspired by their true love on eggs. The restaurant does not only focus on quality and taste, but also serve a great breakfast experience for their customers. They offer fresh and high quality menu where you can indulge in mouthwatering sandwiches made up of eggs, cheddar cheese and soft brioche bun. You can also visit their Venice branch in Pacific Ave. Los Angeles. For more than 68 years, Langer's Delicatessen has been serving the world's finest pastrami sandwich. The popular sandwich, which is also called #19 in their menu, consists of hot pastrami, Russian dressing, coleslaw and Swiss cheese in rye bread. You can stop by at Metro Red Line's Westlake- MacArthur Park station, where you can find Langer's location just a block away. You may also want to try their wide range of seafood, grill and deli specialties all served fresh. Home of the famous chicken and waffle combination in Los Angeles, Roscoe's House of Chicken and Waffles was named as a "Beloved Soul Food Chain" by the New York Times. It has been operating for more than 40 years and is still considered as one of the best food chains that serve this unique combination. The restaurant's menu has attracted celebrities and VIP's like Larry King, Snoop Dogg, David Beckham and even Barack Obama. Their bestselling combinations are the Big Mama Special and Obama Special that is made up of special chicken recipe and an in-house waffle mix that your will surely enjoy. Avis Union Station - 800 North Alameda Street, Los Angeles, . Avis The Bloc Shopping Center - 700 West 7th Street, Suite A 200, Los Angeles, . Avis Los Angeles Downtown - 888 South Figueroa Street, Suite 130, Los Angeles, . Budget Los Angeles - 800 North Alameda Street, Inside Amtrak/Union Station, Los Angeles, . Budget Los Angeles Ca The Bloc - 700 West 7th Street, Ste A 200, Inside The Bloc Garage, Los Angeles, . Budget Los Angeles Figueroa - 888 South Figueroa Street, Suite 130, Los Angeles, . Enterprise Union Bank 4thandfiguero - 445 S Figueroa St, Los Angeles, . Enterprise Downtown Los Angeles - 1944 S. Figueroa, Los Angeles, . Hertz Union Station - 800 N Alameda St, Los Angeles, . Hertz The La Hotel Downtown - 333 S. Figueroa St, Los Angeles, . Hertz Jw Marriott Los Angeles - 900 W Olympic Blvd, Los Angeles, . Hertz Korea Town Hle - 2830 A West Olymmpic Boulevard, Los Angeles, .